Wild River Angler: Spring Fling. "Pass the DEET, these babies are about to pop!" The big rivers (Kennebec and Andro) are still running, well big. We are still feeling the effects of all that great snow in the mountains that resulted in good skiing this winter, including some big late season dumps. So one word for now- runoff. We’ve been itching to squeeze in some early season floats where big streamers and hungry trout are the rule, but so far it looks like we are going to remain grounded on the launch ramps waiting for better conditions. A look at the seven day NOAA forecast is cool, cloudy, and calling for more rain this week, which could be bad news for flows coming down to fishable levels anytime soon. Bingham is checking in at 28,000 CFS, Madison at 31,000 and as we head down stream to Shawmut we are looking at 38,000. The Andro at Gilead is around 11,000 CFS... you get the idea. Is there ever a bad time to fish a stonefly? Still working on that one. The bright spot is the smaller to medium sized rivers. The Wild, Nezinscot, Sheepscot, Swift, Little Andro, Ellis, Presumpscot, St. George- all are offering very fishable water conditions with some good results. Water temps on a favorite early season beat in particular went from 40 degrees to a current reading of 48 degrees in a week- and the fish have responded. You read that right, 48 degrees, this party is about to get started. 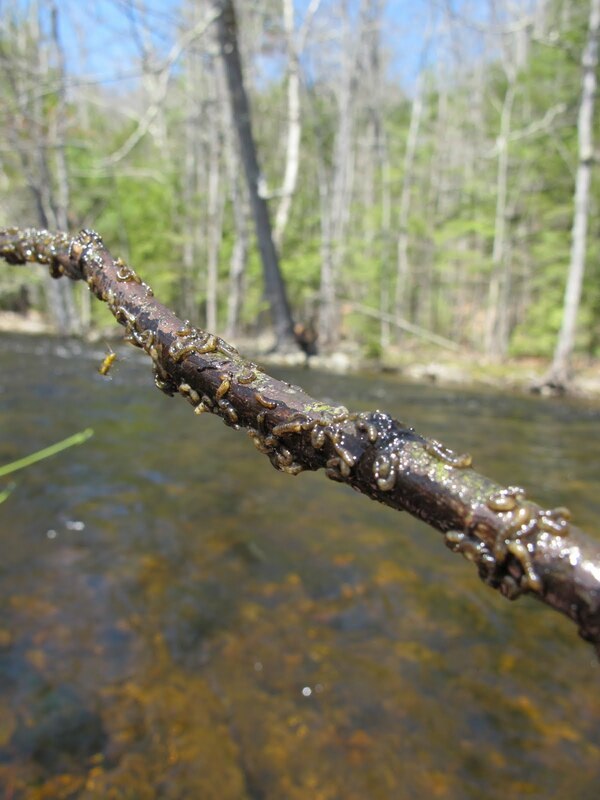 Stoneflies, caddis and midges have been putting bends in rods. Some early sedge caddis have started to show and if we are lucky the fish may start looking up shortly. The leading edge of March Browns are starting to show on some streams. And finally, it’s early May, so dig out that egg box and make sure you’ve got a few sucker spawn handy.